If we made drone use unregulated, we would have many different challenges that are even worse than having a blanket ban on drones. The three main issues with unregulated drone use is privacy, interference with planes and quality of drones. Privacy is an issue that is brought up by the general public. They rightfully feel that some companies may use their drone technology to track them or perhaps spy on them. Therefore some members of the public believe that there should be laws that regulate drones so that their privacy can be maintained. Another major issue that is brought up by airports, governments and aviation authorities is the interference of drones with other aircraft in the area. This is mainly to do with interference with planes. if a drone crashed into a plane, it could cause a lot of damage and even cause the plane to become non-functional. Therefore there has to be regulations that limit the height to which drones can fly and their proximity to certain areas such as airports. The third main issue with unregulated drone use is quality of drones, for example if drones are not regulated then some producers may make drones that are not as safe as they could be, making them dangerous to the public. This could end up harming the drone industry as consumers would grow untrusting and wary of them. Drone regulation is very different around the world in terms of its current state and its future development. The US is one of the biggest markets for drones in the coming years and it is progressing to being the biggest drone market by 2025 . However it still has a lot of work to do in terms of drone regulation. The US has had a blanket ban on commercial drones. The FAA (Federal Aviation Authority) of the US was given in 2012 the responsibility of developing a set of regulations to regulate the use of commercial drones by 2015 . In June of 2014 the FAA announced that it would be unable to meet this deadline and analysts predicted that the regulations would be ready somewhere in between 2017-2019 . For now the FAA has started to give exemptions to certain companies and give them permits to start using drones for commercial purposes. However these permits are very small in number and would not have a major effect on most industries in the US. Drone regulation in the US as of now is fairly strict but looks to open up in coming years and has started to do so with the recent start in issuing permits. In France, there is a much different drone regulation system. Quite far away from what the US currently has. Instead of having a ban on commercial drones it was one of the first countries to introduce regulations for the use of them. It introduced this legislation in 2012. The number of drone operators in France now exceeds 2,000 compared to over 40 in the US . Drone regulation in France works by certifying operators of drones by giving them certification for using certain types of drones. However this certification is given based on what category your drone falls in and each category is defined by the weight, size and flying height. On top of this regulation, if a drone is flying over a populated area, it needs special police approval for each operation in a populated area. This does not mean that although France has given out far much more approval for drones, their laws on drones are without flaws. Indeed France acknowledges that there have been several incidences where drones have been misused, including a few drones that flew over nuclear reactors. However drone regulation in France as a whole seems to be progressing positively and has so far only benefitted the economy. Singapore has a completely different set of drone regulations which it recently put into use in June of 2015. Singapore’s regulations like many other countries give freedom to hobbyists. Any hobbyist flying a drone for non-commercial purposes as long as the drone is under 7kg, more than 5km away from an aerodrome and flying under 200ft, can fly the drone without any sort of permit or pre approval from agencies . However if a drone is being used for any kind of commercial purpose regardless of size, weight or height, must have a permit. This permit can be obtained from the Civil Aviation Authority of Singapore’s online permit application system. At the same time Singapore will also release a list of places in the country where drones must have a permit to fly even if they are flying for recreational purposes . All drones in any location are also not allowed to have dangerous materials or objects and must obtain a permit if they discharge a substance. The main reason for Singapore’s creation of its regulations is to stop the recent trouble that hobbyists have brought. For example a drone recently landed on a metro line in Singapore although it was safely removed. 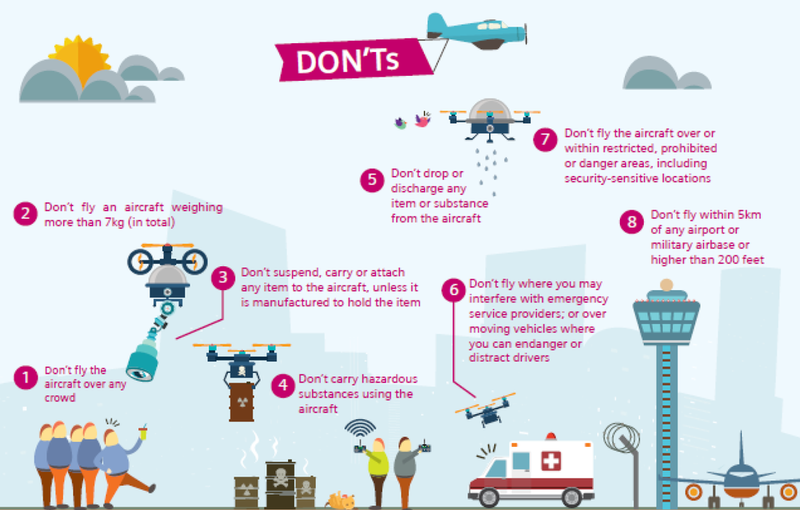 A small infographic by a local Singapore news channel about the new drones regulation can be seen on the right. Therefore Singapore looks likely in the future to change its drone policies when it wants to allow economically beneficial commercial drone use. As can be seen, drone regulations differ by country and have to be specific to the situation of each country. Drone regulation will develop at a different pace in each country and some countries will benefit more from it than others. One country that is lagging behind in drone regulation seems to be the US. Who has a huge technology market that should help boost all industries and the economy with introduction of drones into the commercial market. The hope remains that soon countries will be more liberal with their allowances for drones but also keep in mind the safety of the general public. "Led by Agriculture, Market for Commercial Drones Will Reach $1.7 Billion in 2025." Luxresearchinc.com. N.p., n.d. Web. 1 Aug. 2015. <http://www.luxresearchinc.com/news-and-events/press-releases/read/led-agriculture-market-commercial-drones-will-reach-17-billion>. 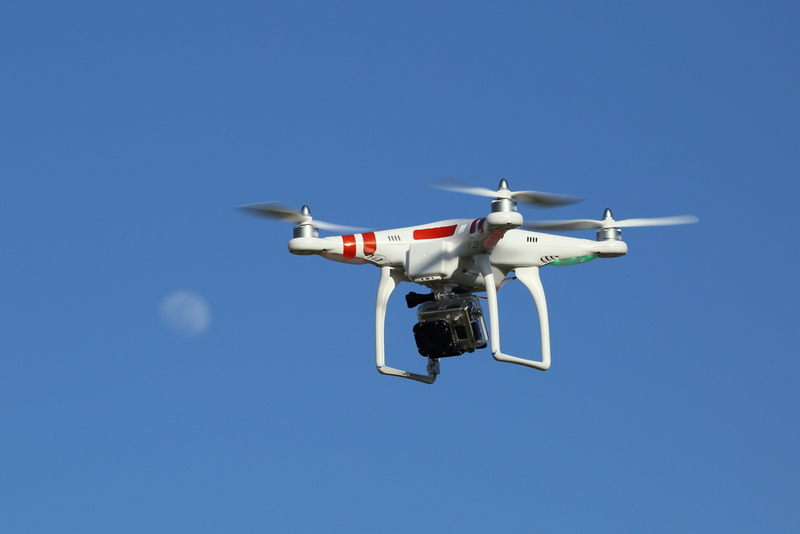 "The FAA's Drone Regulations Won't Be Ready until at Least 2017." The Verge. The Verge, 10 Dec. 2014. Web. 02 Aug. 2015. <http://www.theverge.com/2014/12/10/7370955/the-faas-drone-regulations-wont-be-ready-until-at-least-2017>. "Drones What Are the Rules." Euronews.com. Euronews, n.d. Web. 2 Aug. 2015. <http://www.euronews.com/2015/03/06/drones-what-are-the-rules/>. "Singapore to Introduce Drone Law: 5 Things about These Flying Machines." Straitstimes.com. N.p., n.d. Web. 3 Aug. 2015. <http://www.straitstimes.com/singapore/singapore-to-introduce-drone-law-5-things-about-these-flying-machines>.